HAPPY NATIONAL WATERMELON MONTH! - What About Watermelon? You are here: Home / General / HAPPY NATIONAL WATERMELON MONTH! It seems I got so caught up in all the 4th of July festivities and nice weather that I forgot to wish everyone a happy National Watermelon Month. Who knew July was National Watermelon Month? Not me until a few weeks ago, but I sure am glad I discovered that nugget of knowledge because it gives me the opportunity to eat watermelon morning, noon and night and have a good excuse for doing so. Not that I ever really needed an excuse to justify my behavior in the past, but you know what I mean. I’m trying to think of a way to celebrate Watermelon Month, besides eating lots of watermelon (which I will do). If you have any ideas, let me know with a comment! So get out there, grab some watermelon and enjoy July. If we end up having too much fun, I might petition the watermelon powers-that-be to make August National Watermelon Month too (although some people have already christened August as watermelon month). Oh, one way you can celebrate is by finding a cool watermelon photo online and making it your computer desktop wallpaper to proudly proclaim your watermelon love to co-workers, friends and family members. If they say anything, just tell them it’s National Watermelon Month. I’m using the rather abstract photo found here. It looks sort of like a satellite image of planet Watermelon. Hey Watermelon Guy! Thanks for the GREAT info. 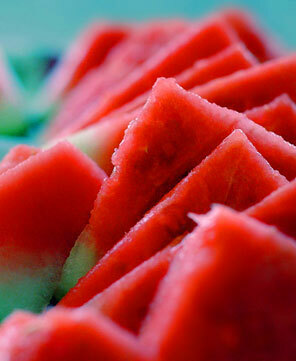 I’m celebrating Watermelon Month over at my blog. Drop buy for some really “cool” goodies!!! Anyone who’s celebrating watermelon is a friend of mine! I’ll stop by Louise. got some Watermelon realted pics from the Alabama Farmers Market day and even a picture of Alabama Watermelon Queen. Great pics, Ed! Keep ’em coming and thanks for the link on your website! link to the image is broken… sad because this was pretty high on google’s watermelon large image search just now and it looks like a wonderful resource for me as a graphic designer.